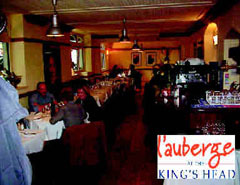 L’Auberge at The King’s Head has been serving stylish French cuisine in a relaxed “Brasserie de Luxe” atmosphere for over three years. Open every day for lunch and dinner with “prix fixe” lunch menus, we look forward to offering you a true French welcome. French brasserie style dining in the restaurant and classic French style bar menu.